Delivery pizza is ubiquitous in this day and age. When we were kids, we used to live in this apartment complex that was conveniently, about 75 yards away from Domino’s. And even though my sister and I loved mom’s cooking, sometimes all we ever wanted was a pizza pie. We’d probably order from that Domino’s at least once a week, and sometimes more. During college, pizza was a food group. Every student org meeting at the beginning of the year had free food to try to recruit new members. For those smart collegians, looking to save a buck and get a free meal, that translated into “eat free pizza for a week”. Surrounded by pizza places, and inundated with weekly coupons, pizza really was the food that kept us going. Whether it was piping hot, or ice cold after a day or two in the fridge, we ate it. And we ate it a lot. There is something magical about this creation of bread, sauce, and cheese that no other food is able to replicate. Since those days, we rarely order pizza anymore. But when the craving hits, we make it from scratch at home. We have pizza almost every other week, or every three weeks, so we can really put some great local and seasonal ingredients on it. It’s one of our favorite meals! The constant in all of our pizza now is Tom’s amazing fresh mozzarella cheese from Lazzaroli Pasta. 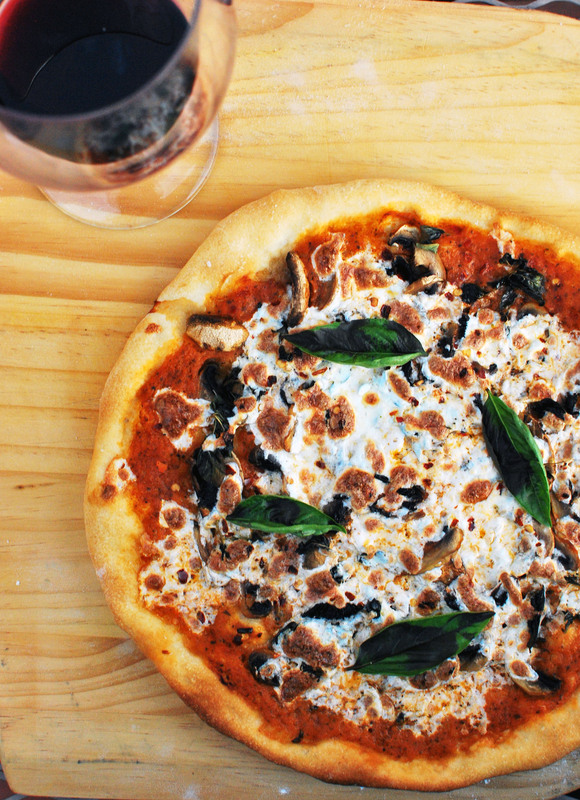 When we make pizza, it’s always Saturday or Sunday, right after we’ve procured some of that creamy goodness. It’s not pizza without it. This pizza is just simple – a little bit of crushed tomatoes, some fresh mushrooms tossed with rosemary and thyme, slices of mozzarella, a shower of parmigiano, and some fresh basil at the end. It’s simple, and it’s delicious. You can put whatever topping you want – squash, pepperoni, garlic, peppers, or something else; you are limited only by your imagination. And at the end of the day, whether it works out or not, there’s always the trusty delivery guy. Toss the mushrooms with the garlic, rosemary, thyme, 2 teaspoons of extra virgin olive oil, and season with salt and pepper. Roll out the dough until it’s pretty thin and circular. Put a little bit of cornmeal on a pizza peel or a pizza pan, to prevent sticking and lay the dough over. Spread the tomato sauce over the pizza. Sprinkle the mushrooms over the top. Add as much mozzarella cheese as you want – I usually add about 4 thick slices. And then, cover with the grated parmigiano. Add a few drops of extra virgin olive oil over the top and bake in the oven until the crust is crispy and the cheese is brown, about 10 minutes. When the pizza comes out of the oven, put some basil leaves on top, and cut into slices. Enjoy! 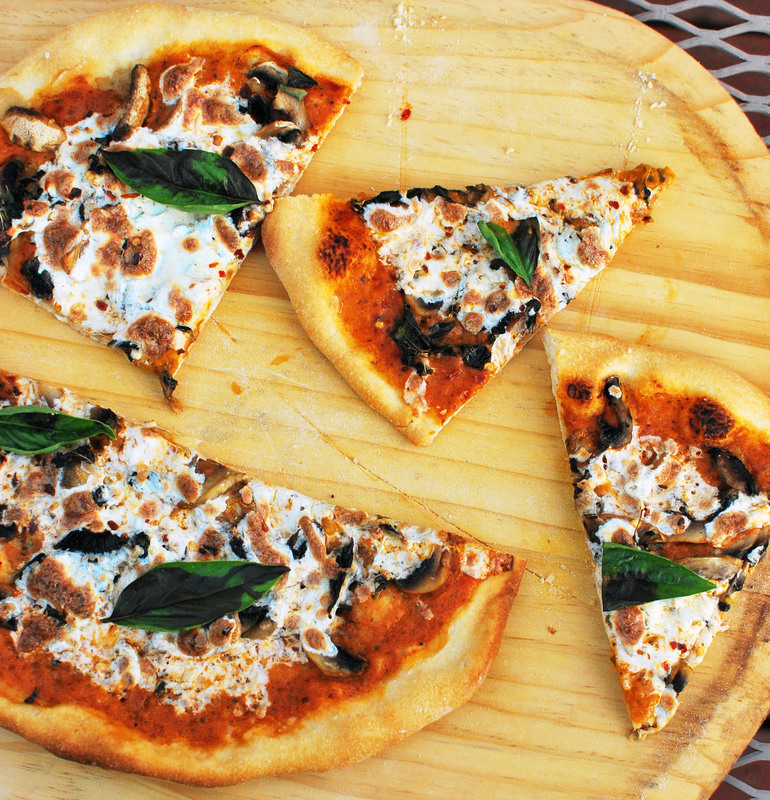 This pizza looks heavenly! The perfect party meal. Thanks for sharing! Oh wow, this looks fantastic! Really great. Don’t talk to me about frozen pizzas or takeaway pizzas… I make all of mine myself, and they are great. Unless I’m eating out of course. haha! That is correct. I only eat homemade food…except when I’m eating out! That is my kind of pizza! Mushrooms and fresh mozzarella!! between the lazzaroli mozzarella, mushrooms, + the homemade pizza dough, this is just pure heaven to me. looks awesome!